The difference in the rate at which the components of a mixture move through porous medium, called stationary phase under the influence of some solvent or gas called moving phase. Fixed phase: Solid like alumina, magnesium oxide, silica gel. Solutes are adsorbed in different parts of column and then eluted by suitable solvent. Fixed phase: Liquid usually water adsorbed on as solid support. Solute gets distributed between adsorbed liquid and moving solvent. Moving phase: Mixture of gases. Exchange of ions of like charges between a solution and a solid (a synthetic or natural resin). Movement of components relative to solvent is expressed in terms of Rf values (Retention Factor). Solvent with donor groups such as –OH, C=O. Presence of acids like HCL. Anions form strong water soluble complex. Ascending: The solvent travel up the paper. Descending: The solvent travels down the paper. Chemical reagents forming colored compounds or complexes. Forms colored metal complexes through two nitrogen and one sulphur atom. Abstract: Chromatography was first described by Tswett in 1903 for the separation of colored/ mixture substances into individual components. It depends upon the redistribution of the molecules of mixture between two or more phases. Nowadays, various types of chromatography are in use to separate almost any given mixture, whether colored or colorless, into its constituents and to test the purity of these constituents. This technique is based on the difference in the rate at which the components of a mixture move through porous medium (called stationary phase) under the influence of some solvent or gas (called moving phase). 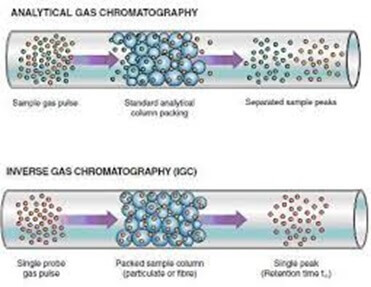 The various types of chromatography include adsorption chromatography, fluid partition chromatography and ion exchange. The main systems employed in partition chromatography are gas partition, liquid partition employing fixed beds (i.e. column chromatography), thin layer and paper chromatography. 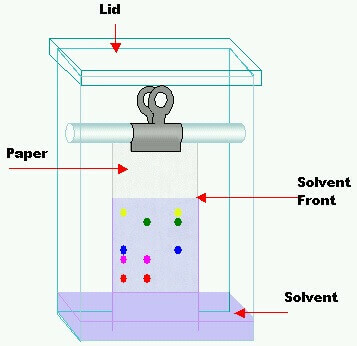 In liquid partition chromatography a mobile liquid phase flows over an essentially stationary liquid phase absorbed on a support, in paper chromatography the support is paper or treated paper, whereas in thin layer chromatography the adsorbent is coated on a glass plate. We shall deal only with selected aspects of paper chromatography with special reference to inorganic analysis (referred as inorganic chromatography). Paper chromatography was introduced by Martin and Synge in 1941. Stationary phase is usually water which is held in the fibers of the paper, moving phase is a solvent or mixture of solvents of desired polarity. In this technique a drop of test solution is applied as a small spot on filter paper and the spot is dried. The paper is place in a close chamber and the edge of the filter paper is then dipped into solvent called developing solvent. The various cations are moved by solvent system at various speeds. The following systems can be separated by this technique and visualized by different reagents. Need help with mastering chemistry concepts? Looking for help with you Chemistry assignment? Need Online Chemistry Tutor to explain tough chemistry concepts such as Chromatography, s-block elements, p-block elements, coordination chemistry? Organic Chemistry assignment due tomorrow? Then Assignmenthelp is the right place to be at. Assignmenthelpnet’s online Chemistry tutors can help you master chemistry concepts and practice important chemistry numerical problems and laboratory chemistry practical. We offer Online Chemistry homework help with Organic Chemistry, Inorganic Chemistry, general Chemistry, Physical Chemistry, Environmental Chemistry or Biochemistry and other allied areas of applied chemistry.